Milan Tobacconists offers a wide selection of pipe accessories for the discerning smoker at reasonable prices. 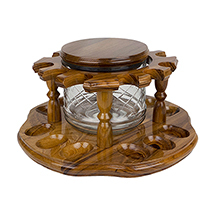 Only our most popular ashtrays, tobacco jars, pipe racks and stands, pipe tobacco pouches, and tools are listed here. If you are unable to easily locate a particular accessory, please give us a call at 877.70MILAN or send an email to customercare@milantobacco.com. We'll do our best to make a match! View our assortment of glass and wood tobacco jars and ashtrays. 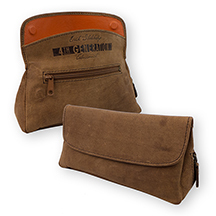 Milan Tobacconists carries a fine selection of genuine leather tobacco pouches and travel cases by Ben Wade, Erik Stokkebye, La Rocca, and others to accommodate your journey, no matter the length! We offer pipe stands and 3-pipe to 12-pipe wooden racks with and without tobacco jars from around the world that are sure to suit your needs. Pipe Tools, Cleaners, Filters, Etc. You'll find "tools of the trade" for the serious pipe smoker here - everything from pipe sweetener to wind screens, reamers, tampers, and cleaners.